This re-issue forms part of the Chandos label’s new commemorative Hickox Legacy series marking the fifth anniversary - in November 2013 - of the untimely death of conductor Richard Hickox. Sir George Dyson achieved so much in his life and never allowed his Northern working class roots to hold him back. He won a scholarship to study at the Royal College of Music (RCM) where he became a Stanford pupil. Subsequently he became a master at Winchester, Rugby and Wellington public schools and was appointed as professor of composition at the RCM. In 1937 Dyson was made Director of the RCM. During the Second World War Dyson kept the RCM open and functioning, even sleeping in the building. I recall Herbert Howells reminiscing that on one occasion during a terrible night in the blitz Dyson slept in the College basement with several other academics including the violinist Albert Sammons and the baritone Topliss Green. Dyson was knighted in 1941 and made a Knight Commander of the Royal Victorian Order in 1953. Commencing in the late 1920s with In Honour of the City the 1930s proved a highly productive time for Dyson in the field of works for voices and orchestra. 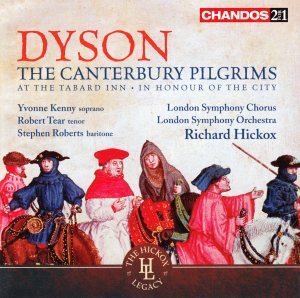 Among Dyson’s most notable scores are The Canterbury pilgrims (1930), St Paul's voyage to Melita (1932), The Blacksmiths (1933) and Nebuchadnezzar (1934). Even the massive Quo Vadis that Dyson completed in 1948 was actually started in 1937. It is often said that The Canterbury Pilgrims is Dyson’s best known work. In fact that accolade must surely go to the RAF March Past written in short score by Sir Henry Walford Davies. Dyson expanded and orchestrated this in 1919. In Dyson’s sacred choral music may lie his most played scores: the Evening Service in D (Magnificat and Nunc Dimittis), Let All the World in Ev'ry Corner Sing and I Will Worship. Some of his organ scores are regularly heard in church services. Dyson gained prominence although today his music, which is mainly available on record, is rarely heard in performance. Orchestra artistic directors and managements are circumspect about putting Dyson works on a concert programme. After all, this is an English late-Romantic known more by reputation rather than heard concert experience. Take away a handful of scores and we would hear nothing of Dyson’s music. This is a situation sadly all too common nowadays with Dyson’s English contemporaries. This re-issued Chandos double disc set launches out with At the Tabard Inn from 1943/46. It was designed as an overture to The Canterbury Pilgrims and is based on tunes from the score. Hickox is in his element with elfin music that develops into a dramatic romp. At 2:59 (CD1, track 1) a tender episode steeped in reflective stillness could easily have been written for a film and reminded me of John. Williams’ Star Wars. An exuberantly glowing passage at 6:00 is evocative of Slav folk music rather in the manner of Mussorgsky and Borodin. A highlight is the affectionate episode at 8:14 (CD1, track 1) with its sweeping lyrical writing redolent of Rachmaninov. Point 9:19 (CD1, track 1) heralds the return of the elfin music and this develops into a colourfully dramatic caper. Given its quality, in particular the uplifting impression it leaves, one wonders whyAt the Tabard Inn isn’t played more often. The Canterbury Pilgrims (1930) is a setting of words by Geoffrey Chaucer. It was introduced in 1931 at the Winchester festival. The title of ‘cantata’ or ‘oratorio’ doesn’t really describe the score. It’s better thought of as a series of musical character portraits. The Prologue featuring folk-infused music is notable for its attractive oboe and clarinet figures. At 1:19 (CD1, track 3) angelic women’s voices intone “When that April with its showers sweet” and at 5:36 (CD1, track 3) baritone Stephen Roberts enters with the words “Befell that in that season on a day” so beautifully in tune with an impressive oaken timbre. In Section II The Knight a brass outburst in the opening measures introduces the mixed chorus singing dramatically “A Knight there was, and that a worthy man”. This reminded me of the mood of ‘The Sea Symphony’ by Vaughan Williams, a fellow student of Dyson’s under Stanford at the RCM. At times the blustery drama of it all brings echoes of the ceremonial Parry to mind; he too was a professor and later director at the RCM. Section III The Squire a musical depiction of the knight’s young and stylish son. It is capably sung by tenor Robert Tear. The next pilgrim is The Nun in Section IV, a picture of the finely attired and bejewelled Prioress Madame Eglantine. Performed by the women’s choir there is an affecting part for soprano radiantly sung by Yvonne Kenny. There’s a dramatic and moving entry for the mixed choir at 6:59 (CD1, track 6). Sung by baritone Stephen Roberts, Section V The Monk comes across as a Friar Tuck character. He could have conveyed more variety of tone. Curiously the opening strongly reminded me of Hollywood movie themes such as the Bernard Herrmann score to the Hitchcock thriller North by Northwest. Described as “shabby” in Section VI The Clerk of Oxenford is a representation of a learnèd character who wears threadbare clothes. The conclusion is highly dramatic before the music fades into the distance. Section VII is The Haberdasher and his Fraternity. The Merchant is scored for tenor and mixed chorus. This is a group of men representing craftsmen’s guilds together with a self-important and possibly none too likable Merchant sporting a stylish forked beard. Scored for baritone Section VIII is The Sergeant of the Law. The Franklin is an influential society figure of some wealth and status in the legal profession. With Dyson’s mainly dark textures one gets a sense that the two characters are not entirely trustworthy. Section IX The Shipman for mixed chorus convincingly depicts this pilgrim as a salty seafaring character steering his vessel through squally waters. The tone of the music in Section X The Doctor of Physic suggests that he is a difficult personality to like. This self-appointed expert of astrology is portrayed by dark-hued and unsettling writing. Singing with real aplomb, tenor Robert Tear is expressive and highly convincing. We encounter bluster and good humour in Section XI The Wife of Bath - an affluent and cosmopolitan woman. Soprano Yvonne Kenny is fluently impressive as the serial wife - a magnet for five previous husbands who all left their valuable estates to her. Weighty and atmospheric music for tenor and mixed choir feature in Section XII The Poor Parson of a Town. This intelligent man of the cloth is quite complex and is represented by some richly textured music. Set in the hostelry the Tabard Inn Section XIII L'envoi is scored for tenor and mixed choir. Each of the Canterbury pilgrims is invited by the inn-keeper to tell a story. He starts with the knight. The opening of the Prologue is briefly repeated and the work ends with a short part for off-stage horn - a bidding farewell. With the exception of a small number of sacred pieces Dyson’s first major choral score is In Honour of the City. Described by Dyson as a fantasia for chorus and orchestra this setting of words by William Dunbar was composed in 1927/28. Dyson greatly admired the work of Dunbar the Scottish medieval poet who was associated with the court of James IV of Scotland. In Honour of the City of London gives the poet’s rather glorified view of the royal and most sovereign city of London including many a goodly knight, velvet gowns, chains of gold, and delectable high-born ladies of the nobility. All this colourful characterisation clearly appealed to the Halifax-born composer. Dyson interpolated into the score an idealised sense of the River Thames flowing though the city, the famous bridge and the Westminster chimes - which incidentally didn’t appear in London until 1859 some three-hundred and fifty years after Dunbar’s verse. The choir and orchestra admirably surmount Dyson’s rather congested writing. I was impressed by the hearty ebullience and committed choral singing with the massed voices sounding pleasingly secure. Again in the writing it is not difficult at times to hear the sound-world of early Vaughan Williams, Dyson’s contemporary at the RCM. Recorded in 1996 at the Blackheath Halls, London, Richard Hickox has been provided with clear and well balanced sound. To cap what is a well presented release I can report that full texts are included together with an informative and interesting essay. Impressively performed and recorded this re-issued Chandos double CD setmakes indispensable listening for lovers of late-Romantic English music.